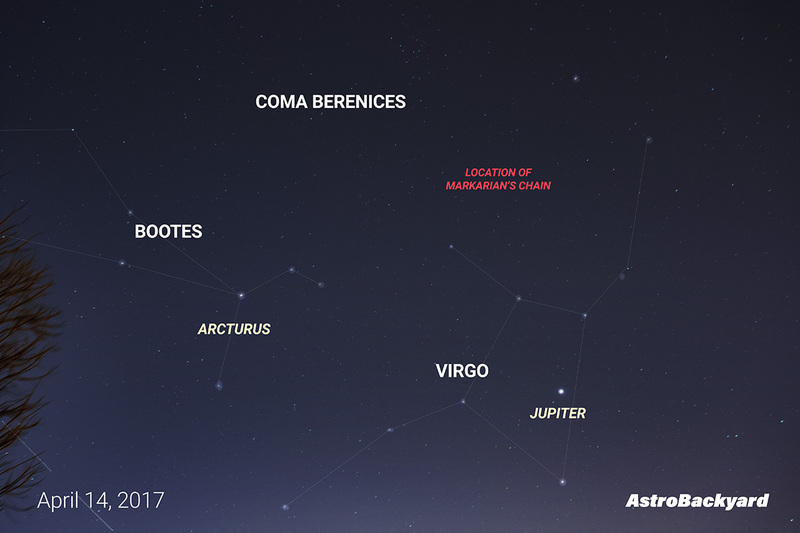 Markarian’s Chain is an impressive photography subject for those with a camera and telescope to capture it. This string of 7 distinct galaxies is a member of the Virgo Cluster and epitomizes the types of astrophotography subjects available during galaxy season. On Friday Night (Good Friday), I was spoiled with a second consecutive clear night sky. The moon would rise above the horizon by 11:30 pm, so I had a few hours of moonless imaging time to squeeze in. Markarian’s Chain is a prominent feature within the impressive Virgo Cluster of galaxies. M87 is the brightest member of the group, a very large elliptical galaxy. 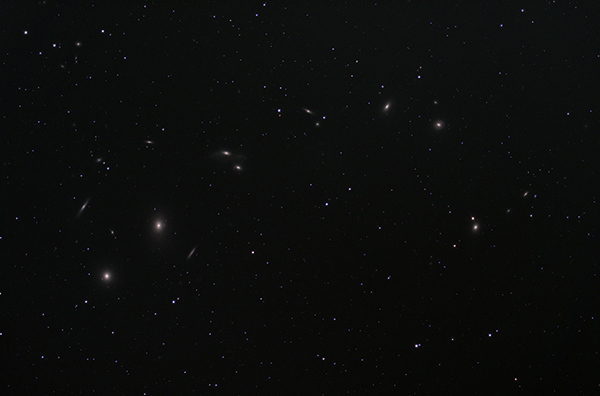 My final image of Markarian’s Chain included 2 hours and 10 minutes of total integrated exposure time.  To see a larger version of the image with complete photography details, continue down this post. For a run-down of the processing steps used, have a look at my tutorial on deep-sky image processing in photoshop. With a nearly full moon traveling across the ecliptic, deep-sky astrophotography becomes a lot more challenging. Couple this with my lack of any filters for the ASI071, and you’ve got a difficult imaging session ahead. Luckily, the Virgo Cluster of galaxies including Markarian’s chain showcases many interesting, yet mostly featureless objects. A forgiving target for imaging conditions such as this. Usually, when the moon is out, I’ll capture H-Alpha data using my Canon T3i and Astronomik 12 Ha filter. However, my previous attempts at capturing Ha on a small galaxy (The Pinwheel Galaxy) proved to be of limited value. I think I’ll save the Ha capturing for some of the Nebulae that will be gracing our night sky in the coming months. For now, I’ll focus on collecting RGB frames using the OSC (One shot color) ASI071 camera when moonlight is limited. I can only hope that the clear skies continue as we near closer to the weeks on either side of the new moon. The ZWO ASI071MC-Cool remains in my procession for the time being, and I couldn’t be happier. Spending time with this camera has allowed me to further familiarize myself with the CCD imaging process and software such as Sequence Generator Pro. If you are transitioning from a DSLR camera, I think you’ll find that the AS071 is a big improvement. I’ve been cooling the camera to -40 degrees when shooting targets in my backyard, and the images produced are virtually noise-free. The camera has some pretty neat features including a built in anti-dew heater window heater, that can be turned on and off. I haven’t had to use the feature yet, but I have a feeling it will come in handy during the summer months. This area is considered to be the core of the Virgo Supercluster, and is a truly spectacular sight. The Virgo cluster contains some serious astronomy eye-candy. The sheer number of galaxies in this area of the sky is staggering. If you are looking for a deep-sky view at the Universe, you’ve found it. The Virgo Cluster is the closest cluster of galaxies to our own Milky Way. Markarian’s Chain appears to form an arc pattern, with 7 or more galaxies making up the formation. M84, M86, and M87 are the largest galaxies of the group, cataloged by Charles Messier. The galaxies may appear small, but each of them contains more than 400 billion stars or more. Go ahead and explore this amazing area in detail. Click here for a large version of the image. Where is the Virgo Cluster? Below you will find a wide-field image of the constellation Virgo and the surrounding area. Jupiter is seen at the bottom right and Arcturus on the left. Markarian’s Chain is not observable visually but will become evident in short exposures at the right focal length. Using the 2-second refresh rate on SharpCap, I am able to spot the 3 brightest galaxies in Markarian’s Chain. I am quite proud of my framing on this one. My goal was to center Markarian’s chain in the field of view while capturing as many additional distant galaxies as possible. 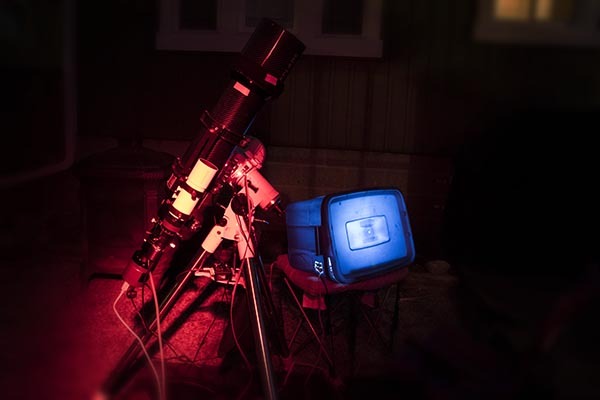 As I mentioned, I could really benefit by using filters with the ASI071 while imaging in my light-polluted backyard. Specifically, a UV IR Cut filter would reduce star bloat, and correct much of the color balance issues I had to tackle in post-processing. 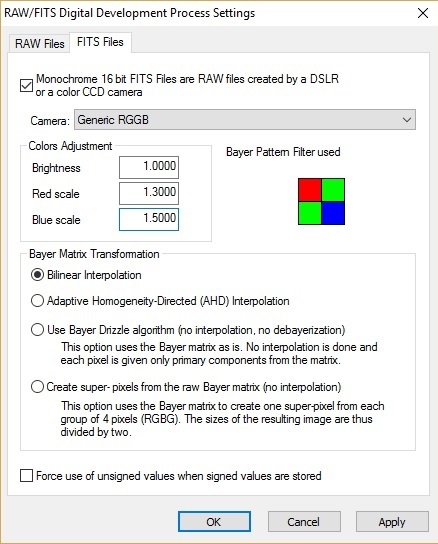 Thankfully, I received some useful information about stacking images with this camera’s color profile and Bayer pattern in DeepSkyStacker. Because of the RGGB pattern used in the sensor of the camera, the default stacks were coming out with an odd color cast (mostly green). I corrected this by a large degree by using the following parameters for RAW/FITS files in DeepSkyStacker. As you can see, I bumped up the red and blue scales to create a more balanced final image. Once this was corrected, my standard deep-sky processing techniques were effective in boosting contrast, removing gradients, and reducing star size. The curves adjustment applied was much more subtle than it would be on a nebula. Because of the visual characteristics of the galaxies in Markarian’s chain, you do not need an aggressive stretch to bring the objects forward. I could have brought the “glow” from these galaxies out further, but not without degrading the quality of the background sky. Much more exposure time would be required for the best of both worlds. I forgot how nice it was to spend the majority of the night outdoors while the camera was running, rather than monitoring TeamViewer in the house! The milder nights have been hovering around 1 or 2 degrees, which is just enough to keep my hands from freezing. I’ve mentioned this before, but I can’t stress enough the importance I give to the overall experience. I believe that it is easy to get sucked into the fine details of your equipment and obsessing over the automation of your gear. For me, I never want to lose the feeling I get when I look up on a clear April night. 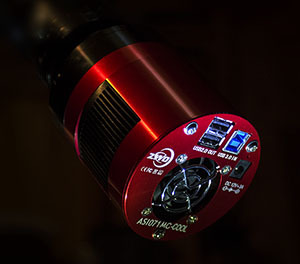 In case you are wondering, I’ve still got my hands on the ASI071MC-Cool from Ontario Telescope and Accessories. They have graciously given me an extended period to use this imaging camera. For now, my Canon DSLR remains stored in the garage. Looks great Trevor, I will see if I can pull the same thing off once the rain clears in a WEEK. My 071 is in the shop so I’m going to try the 60D or T3i. How are your colors lining up in DSS? Thanks Sean! The forecast looks pretty wet for this week over here as well:( Glad you are getting the ASI071 sorted out. The colors are much improved in DSS. Changing the color scales for the red and blue channels (see the graphic in this post!) helped immensely! That Shot of Markarians link is absolutely Amazing, Awesome work Trevor.